I got a donut pan for Christmas and had to fulfill its donut-pan-destiny. It’s only fair. Team Health has been in full effect in our house. I got my husband hooked on juice. We’ve been eating veggies like true professionals. Did I mention that my sweet-guzzling-cookie-butter-loving husband made me purchase chia seeds yesterday? I watched in amazement as he added a tablespoon to his green juice and knocked it back like a champ. Superfood-tastic. It’s getting serious. This weekend, aside from the juice guzzling and salad eating we also managed to make a pretty hearty Shepherd’s Pie (which I plan to adapt and post here for you lovelies!) and try two new cocktails from our fancy new bar book! You can look forward to some fun cocktail adventures this year. We are learning some pretty cool tricks! My husband and I used to walk to our local donut shop, load up on a dirty dozen, eat half of them and then take naps into the afternoon. Yes. That happened. This was years before I knew about my gluten-sensitivity and gained an adult metabolism. What is it about donuts that you can’t eat just one? Perhaps it’s the intense rush of sugar and the total lack of nutrition. They leave you running on empty. Donut comas are totally real. I’ve had several. These are not coma-inducing donuts. At all. Dare I say they are almost healthy? They are made with almond meal, and are minimally sweetened with maple syrup. The tops are covered in a chocolate and coconut ganache, thickened with coconut and almond milk. They are then dipped into some sweetened coconut flakes. Yum. We’re doing pretty good here. Add all of your dry ingredients to a food processor and pulse until they are combined. Add in your wet ingredients and process on high until your mixture is thoroughly combined and smooth. Grease your donut pan, and pour the batter evenly into each of the donut molds. 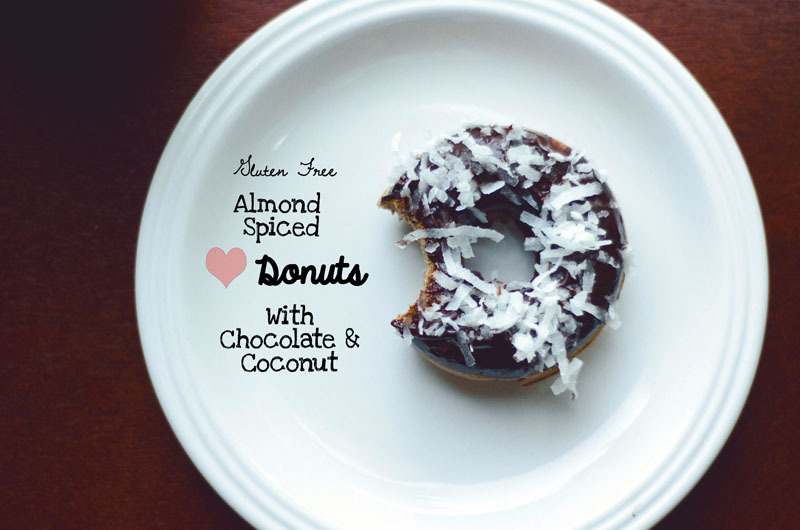 This recipe should make six donuts. 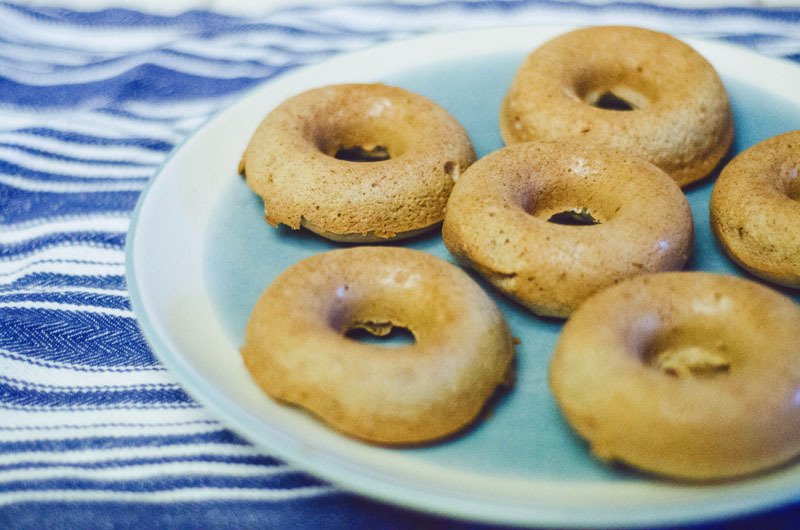 Remove the pan from the oven, pop out your donuts and allow them to completely cool on a cooling rack or a separate plate. 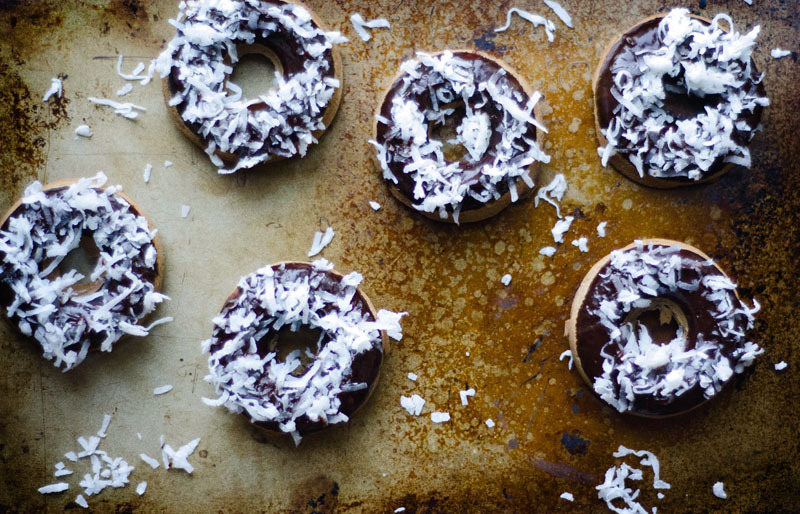 When your donuts are cool, you can start to make your ganache. Heat your coconut and almond milk in a small pot over low heat until it starts to boil. Add in your chopped dark chocolate until it is completely melted. Once the ganache is finished, you can begin to assemble your donuts. Put some coconut flakes on a plate or in a shallow dish and set aside. 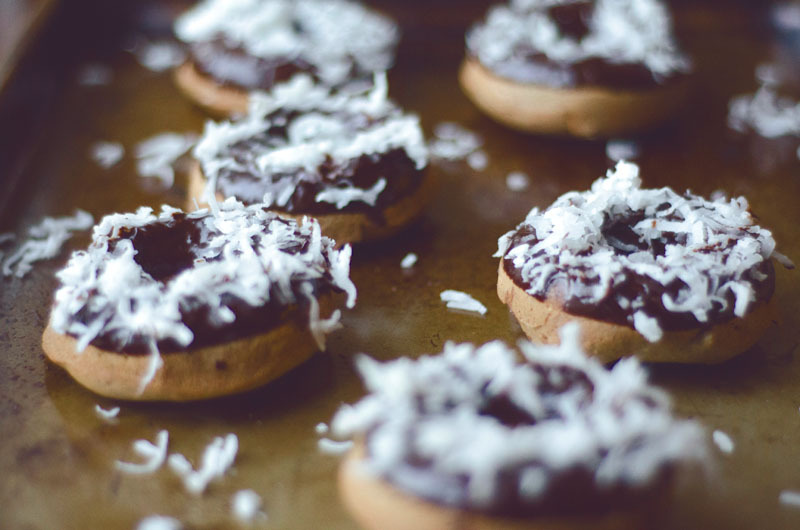 Dip your donuts one and a time into the chocolate ganache, and then immediately into the coconut flakes so that the coconut flakes adhere to the chocolate. You are my hero!!! 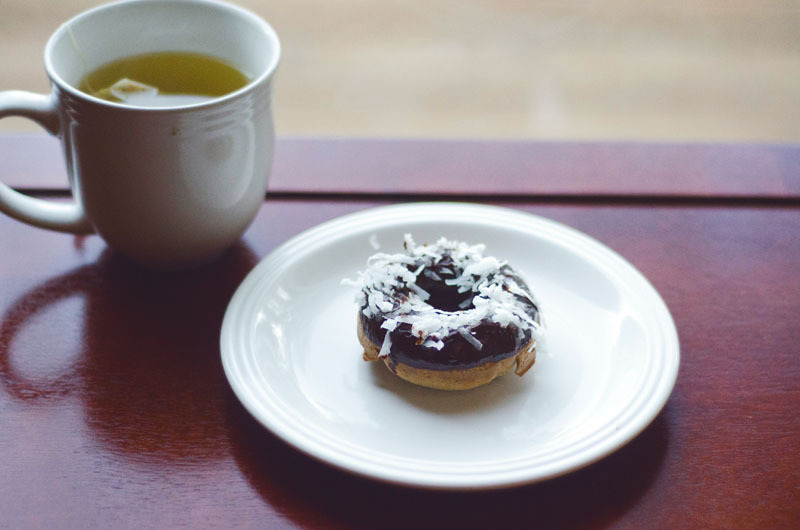 These look so amazing – I have missed lovely warm donuts so much. Going online to buy a donut pan NOW. Thanks much! Allison… YOU are gluten free AND you like to add glitter to things/crochet like a champ?! Maybe you are MY hero!! 🙂 Happy donut making, friend! I may buy a donut pan JUST so I can make these. It’s just something you need to do. Yes! Do it. I am starting to realize that I might be obsessed with the combination. I think you will find chocolate and coconut together a lot on this blog. I dig your photos Gina!